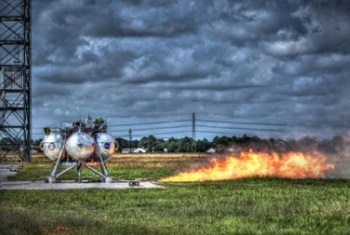 Project Morpheus – an experimental lander project – has enjoyed a successful free flight at its test range at the end of the Shuttle Landing Facility (SLF) on Monday. 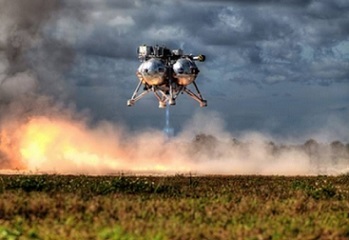 Previously delayed by poor weather at the Kennedy Space Center (KSC) – along with technical issues – Monday’s free flight achieved another milestone for the technology demostrator that may be adopted by future commercial lunar landers. Manufactured and assembled at JSC and Armadillo Aerospace, the Morpheus system is large enough to carry 1,100 pounds of cargo to the moon. This cargo capability includes the ability to transport a humanoid robot, a small rover, or even a small laboratory to convert moon dust into oxygen. Morpheus is designed as a full spacecraft system, with all the associated subsystems: avionics; software; guidance, navigation and control; power; power distribution; structures; propulsion; and instrumentation. By NASA standards, the project is run via minimal funding, with a small team of around 30 people. Although SLF fire crews were on hand, the pressurized system could not be approached as it laid crippled on the site. Eventually, the fire breached the pressurized fuel tanks, resulting in it exploding. At the end of October, the lander’s engine was successfully ignited six times in a row, with each burn lasted 600 milliseconds. 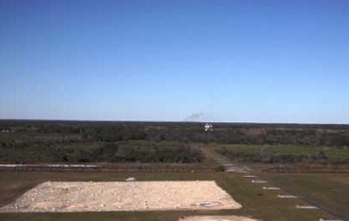 This period of testing was challenging, resulting in the test schedule at KSC to be delayed several times. In November, the vehicle was transported to the T-Shelter at the Kennedy Space Center, in preparation for a series of free flight tests. All KSC testing has been conducted without incident during its second visit to Florida. Monday’s test was known as Free Flight 7, successfully increasing the distance the vehicle rose to, with 465 feet the altitude for this latest test, with a translation across the ground of 630 or so feet. In preparation for the test – and the associated risks – KSC staff were told surrounding areas will be restricted. “Due to the untethered test flight of the Morpheus vehicle on 10 Feb, temporary road closures of up to 30 minutes should be expected at the following locations from 1200-1630 hours,” noted the release. Morpheus has mutliple safety controls including onboard soft abort systems and a wireless Flight Termination System. In the end, the test, which began just after 18:00 UTC, was a success, with only a small fire caused on the field, which was no threat to the vehicle. 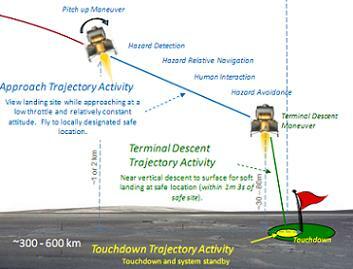 Should the remainder of free flights work as planned, the next stage will be to install a sensor package designed to detect and avoid hazards on the ground. The hazard area had already been constructed at the end of the SLF, resembling a mini lunar surface area. These tests area currently expected to take place in March and April of this year. Providing the test series is a success, Morpheus could then directly contribute to numerous technology goals. 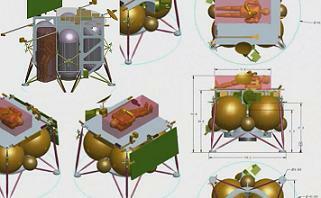 The project has been openly promoted to commercial companies interested in future lunar landings, such as Golden Spike.